We have thousands of properties for sale all over France. But we've no property for sale in Quiberon at the moment. And that's something we want to change. 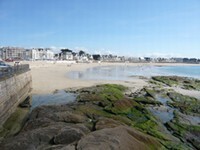 If you have a property to sell in Quiberon (or nearby) then act now to get a 50% discount. Just place your advert in the normal way (Click here to place your advert). Then send us an email quoting "Quiberon" and telling us that you you saw this offer. The resort of Quiberon is somewhat unique, being not quite on an island but not quite on the mainland either. It lies at the south of the Quiberon Peninsula, a long thin fourteen kilometre stretch of land that is connected... just... to the mainland. In fact Quiberon was an island until the 11th century, when the gradual clearing of pine forests started to cause a build up of sand, which eventually became the peninsula it is today. Once upon a time, the people of Quiberon survived through the fishing trade, but these days the town is a very popular and successful tourist resort. Quiberon also has all necessary services, a full complement of leisure facilities such as excellent bars and restaurants and a huge variety of cultural and sporting activities. What makes Quiberon unique is its supreme setting on this little peninsula, jutting out into the Atlantic Ocean, offering some of France's most dramatic views. Saturday is market day in Quiberon, although during the busy summer months an additional market is held on Wednesdays in Port Haliguen. Port Haliguen lies to the east of Quiberon and consists of a large marina and harbour, filled with yachts. Quiberon used to survive mainly by its sardine fishing industry, and there is still a considerable reliance on this today, with a large canning plant on the peninsula. When in Quiberon it is, of course, not obligatory to try the sardines, but you would be well advised to do so, as they are quite probably, the best sardines in the world. The fishing harbour of Port Maria in the south of Quiberon is charming, and a source of constant entertainment as it is always bustling with life and colour. Quiberon also hosts a lively fish auction, where the day's catch is quickly snapped up by hoteliers and restaurateurs, eager to bring the very best of fresh fish to their tables for you to enjoy later in the day. Another thing that you should do in Quiberon is to take advantage of the location to visit the lovely collection of small islands that lie just off the peninsula. Boats depart regularly from Port Maria, to Belle Ille, Houat and Hoedic. Quiberon is a notable centre for seawater therapy, so if you want to combine a stay in one of Brittany's most beautiful places with a restorative spa treatment, Quiberon should be at the top of your list. There are many other activities possible in and near Quiberon too. With the sea ever present, it comes as no surprise to find that you can swim, fish, sunbathe, sail, windsurf and take part in a whole host of sand and sea based activities and sports. Walking, a frequently underrated activity, is superb here, with the stunning coastal paths reserved just for walkers, keeping them safe and well cared for. All of Morbihan is accessible from Quiberon, and it really is worth exploring. The standing stones of Carnac are a must see, and the main town of Vannes is certainly worth your time. The department of Finistère is also not too far away, lying just to the east, which is a magical land of folklore and mystery, and great fun to discover. You can choose to fly to the airports of Lorient, Rennes, Brest or Dinard. Lorient is served by Aer Arann; Rennes by with Aer Lingus and flybe; Brest by flybe and Ryanair; and Dinard by Ryanair and Aurigny. If travelling by ferry, the port of St Malo is the nearest, although all the northern ports are within a reasonable driving distance. There is a TGV station in nearby Auray, just on the mainland, making train travel a very realistic and enjoyable alternative to flying. Travelling by car you should follow the N165 road, taking the Auray exit and following signs to Carnac from there. Take the Quiberon road across the causeway to the peninsula, and find Quiberon on the D186a. Morbihan is a popular department in a popular region, so prices are unlikely to be particularly low. It is possible to find a variety of property for sale on the peninsula, with old fishermen's houses and modern apartments all occasionally on the market. Rental markets and values are high, so if you do buy here you should be able to obtain a good return, should you rent the property out. Do you know Quiberon better than we do? 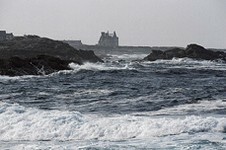 Do you have photos of Quiberon? Quiberon lies in the north-west of France, in the south of the Morbihan department, at the tip of the peninsula that juts out into the Atlantic Ocean. Access: By air: Fly into Lorient, Rennes, Brest or Dinard. By boat: The ferry ports of Brittany and Normandy are within easy reach. By road: The town is found from the D186a road. By rail: The nearest TGV station is at Auray. Economy: Tourism is now important, although in days past sardine fishing was the primary occupation of the townsfolk. Sardine canning is still a significant industry. Interesting fact: Quiberon escapes being classified as an island by the narrowest of margins... a bank of sand is all that connects it to the mainland.